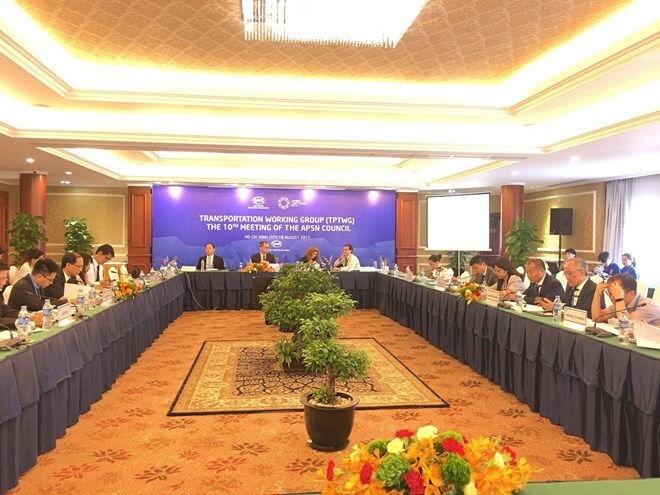 HCM City (VNA) – The tenth meeting of the APEC Port Services Network (APSN) Council under the Transportation Working Group (APTWG) was held in Ho Chi Minh City on August 18. Delegates at the event updated the APSN Five-Year Strategic Plan between 2014 and 2018, noting that the plan is important to setting directions for the organisation and the next Council meeting. Regarding the handling of dangerous goods at ports, they agreed that there is a need for updated dangerous goods guidelines for this region that would consider the nature of APEC economies and their different levels of development. The Council decided to compile best practices on the settlement of dangerous goods at APEC ports. The meeting also reviewed outcomes of the 2017 APSN Workshop on Restructuring of Shipping and Port Industry: Trends and Challenges that took place in HCM City on August 15-16, 2017. The Council endorsed the proposed Action Plan for 2018, which sets forth major meetings and activities organised by APSN, APEC transportation meetings, and specific studies and projects. The plan also mentioned the APSN Five Year Strategic Plan during 2019-2023 with strategic directions, key objectives and specific actions of APSN in the next five years. TPTWG’s objective is to achieve the liberalisation of transportation services and works to enhance the safety of APEC transport systems to encourage economic development in the Asia-Pacific region. It also aims to balance security, safety, and environmental requirements with trade facilitation. These efforts are focused on: facilitation of domestic policy regulations; development of intermodal supply chains and secure transport activity; integration of corporate social responsibility; and building the capacity of all stakeholders to help them reach the eventual goal of free and open trade.